« Didsbury, Gatley, Cheadle, Hazel Grove, Poynton and Holmes Chapel! Just after we got home from caching on Saturday, I logged on to GC.com to see there was a ton of new caches near home just out: 19 around a country park, 2 at a local church and 2 more along the old Wellington to Market Drayton railway line. I was all cached-out for the day so decided to make a start on them on Sunday. I thought I’d leave the country park ones for another day, so just set off to find the other 4 new caches. I soon arrived at the first cache and parked up opposite the Dairy Crest Creamery in Crudgington, to try and work out where the PF to the cache started. Just as I was doing this, a familiar car pulled up alongside. It was Mark and Annie from cannonedwards. Great to meet you both again. We all set off to try and find the start of the PF and failed (we’d not gone far enough along the road and as is usual around here, there were absolutely no finger posts to make life easier). We returned to the cars to think what Plan B might be when another car drew up. It was Greygeeza and Tike – nice to meet you both again. Plan B turned out to be to wander further down the road, so off we all set. The security guy on the Creamery gates was giving us quizzical looks by this point as I bet he’s never seen so many people here before! We spotted a gate that lines up with the start of the PF on Memory Map, so off we set. As I expected, the field was totally cropped, with no sign of the PF that was supposed to go through the middle of it. We skirted the edge of the field and Mark and Annie had found the cache before the rest of us natterers (is that a word?) had caught up. Once back at the cars, we said our goodbye’s as we were all headed off to different caches. I drove down to Wellington, where the old railway line used to join the Wellington to Shrewsbury line. This section is now part of the Silkin Way and a nice walking path. The cache was a quick find, after initially looking at the wrong ivy covered tree. Next stop was Edgmond Church and the new Greygeeza and Tike caches. 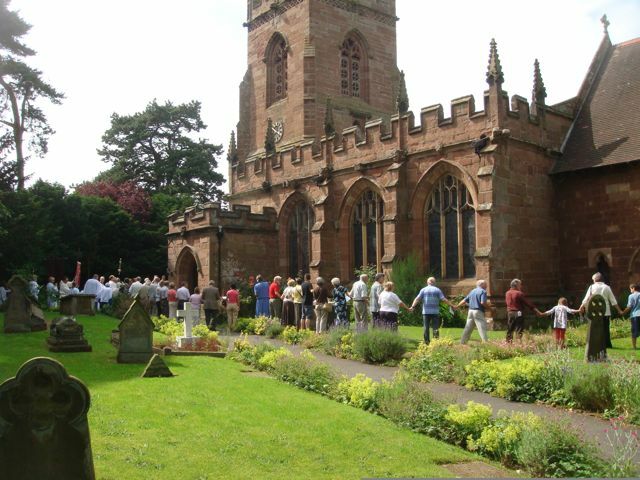 I walked into the churchyard and was just getting the details needed to calculate the final cache co-ords (it’s a multi cache) when the church door opened and the vicar lead the congregation out to form a rin round the church, all holding hands. They then proceeded to sing some hymns. I’ve no idea why they would do this, but it was really nice to stand and watch for a few minutes (I had to avoid a few gazes as I suspected I might be invited to join in and there was caching to do!). Next, it was a nice walk down a bridleway to GZ and an easy find. In the distance I spotted someone else walking away, that looked suspiciously like Allun from the Shropshire Seekers (it turned out it was him). A short walk later and I was at the bonus cache, which was another easy find. Now, just a short walk over the fields to the Jeep and onwards to home.